All being well, I'm going to be having an 8 hour layover in Oslo next week. I'll be changing between airlines and between tickets, and I won't be able to check my luggage through. Given the length of the layover, I won't be able to re-check it on arrival, so I'm pondering what to do with it during that time. My current plan is to hop on the train into the centre of Oslo, and do some sightseeing, but without the luggage! The Oslo airport website gives details of their left luggage, but it's priced per item so for 2 bags for >5 hours would be a moderate cost. The NSB website says that Oslo Central has luggage lockers, but not how much nor what size. This tourist website mentions prices for the lockers varying by size, but doesn't mention the sizes. Assuming my bags do fit in the largest locker in Oslo Central, it looks like the cheapest option is to take my bags on the train, pop them in a locker then go sightseeing. However, if it turns out they don't fit, it's then a bit late to leave them with the airport left luggage! 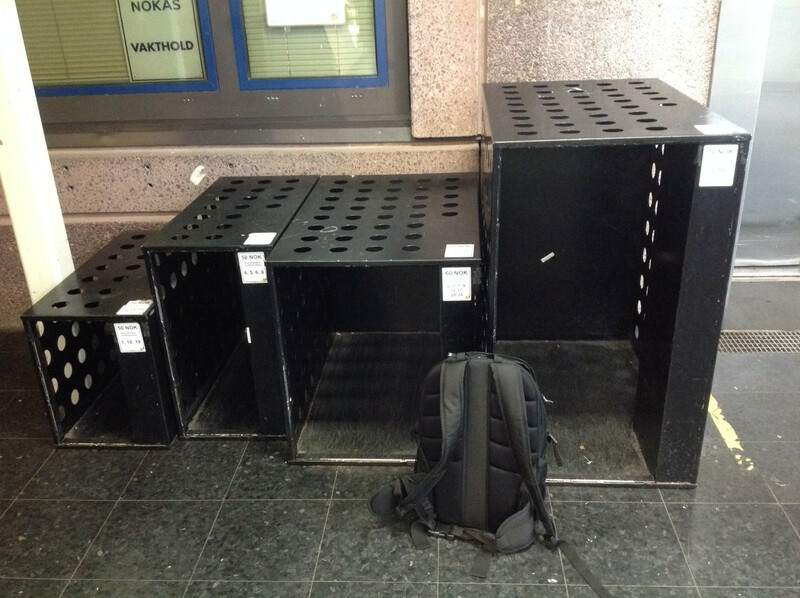 So, my question is then, how big are the lockers in Oslo's Central railway station? Having worked out what size you want, you then wander round the banks of lockers (of which there were something like 5 rows). When you see a bank with the size you want, the screen will tell you if any are free (look for the green bar at the top), then switch it to English if you need and proceed to rent your locker. Costs were from NOK 50 to NOK 70 per 24 hour rental, but you forfeit any remaining time if you open the locker during the period. In addition, they also had a set of full height ski lockers at the very back, so you could store your skis too! Looked to be about 20 or so of those. Not the answer you're looking for? Browse other questions tagged luggage norway oslo or ask your own question. Can I bag wrap my suitcase at Leeds railway station?